GUNNISON, Colorado, April 30, 2018 (ENS) – Four conservation groups today reached an agreement with the U.S. Fish and Wildlife Service to stay their legal action while the agency prepares a recovery plan for the Gunnison sage grouse. This critically imperiled bird, surviving in Colorado and Utah, is known for its elaborate courtship rituals. The coalition’s lawsuit argues that the grouse’s situation warrants Endangered rather than Threatened status under the U.S. Endangered Species Act. But today’s agreement maintains the bird’s Threatened status although it does require the Fish and Wildlife Service to develop a recovery plan to identify and reduce threats to the species within 30 months. “This critically imperiled species has really suffered as its habitat has been lost to oil and gas drilling, urban sprawl and overgrazing,” said Ryan Shannon, a staff attorney at the nonprofit Center for Biological Diversity, one of the four plaintiff groups. With a history of habitat loss and fragmentation, just seven isolated populations remain in a small area of southwestern Colorado and southeastern Utah. Of those seven populations, six are in decline. There was an approximate total of 4,000 birds as of spring 2017. 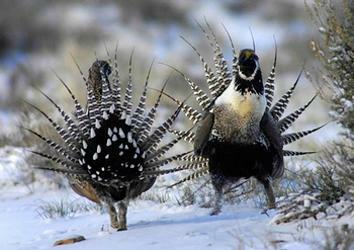 In November 2014 the Service designated Gunnison sage grouse as a Threatened species, rather than the more protective Endangered species designation the agency had proposed in January 2013. In 2014 the Service also reduced the area to be protected as critical habitat for the dancing birds by nearly 275,000 acres between the proposed and final rules. The new agreement ensures the recovery plan will be based on the best available science and address the impediments to the grouse’s recovery from livestock grazing and other threats. “Livestock grazing is a major problem for the Gunnison sage grouse, with two-thirds of public-land grazing leases failing to meet even the most basic land-health standards,” said Erik Molvar of Western Watersheds Project, another of plaintiff groups. “Federal and local agencies have turned a blind eye to habitat degradation caused by cattle, but this settlement should require federal agencies to start taking steps to remedy problem livestock grazing in important Gunnison sage-grouse habitats,” he said. The public will have an opportunity to comment on the draft Recovery Plan when it is released by the Fish and Wildlife Service.